﻿ ARE POLAND AND TURKEY RIVALS IN THE EU AGRICULTURAL MARKET? ARE POLAND AND TURKEY RIVALS IN THE EU AGRICULTURAL MARKET? Poland and Turkey are one of the largest global producers and particularly exporters of fruits. The export is of great importance to domestic producers of these fruits. 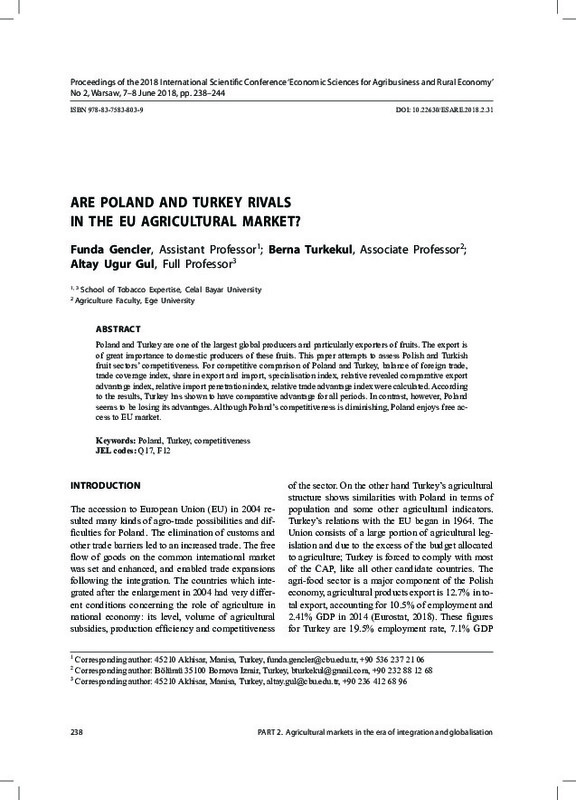 This paper attempts to assess Polish and Turkish fruit sectors’ competitiveness. For competitive comparison of Poland and Turkey, balance of foreign trade, trade coverage index, share in export and import, specialisation index, relative revealed comparative export advantage index, relative import penetration index, relative trade advantage index were calculated. According to the results, Turkey has shown to have comparative advantage for all periods. In contrast, however, Poland seems to be losing its advantages. Although Poland’s competitiveness is diminishing, Poland enjoys free access to EU market.